I like play with westernized pieces, the chinese characters are small, difficult to see. Now I'm making fast progress with it, doing in playok xiangqi web playing online. In my opinion, for better visualization for western begginers, rather than traditional black-and-white checkering, board need special marking for squares, accesible by elephants. And different marking for advisors. And advisors should not resemble queens (unless if player, being new at Xiang-Qi, is not new at Shatranj). Of course, it is not needed if one already visualize it well. My own prefrence is traditional board. That is lovely. Very nice bit of design and work. I converted a travel mini Chess set (square size 15.5mm) to become multi-functional set for Xiangqi and international Chess. Because Xiangqi can be played on the grid points, all that is needed is an extra rank to be slipped in between the board halves. Because this is the River, it needs no checkering. And then some extra pieces for the Cannons and Advisors, which I cut from a rond stick, or made from wood beads, respectively. The River can be inserted on the top face of the set for Xiangqi, or at the bottom for international Chess (to fix the two halves to each other). When the box is closed, it fits in sideways. I like that queen is for guard and bishop for minister. So, how to westernize Shogi set? Using bishop and rook symbols for angle mover and flying chariot while knight symbol is used for honourable horse is not corret. If bishop and rook are used for AM and FC, different symbol should be used for HH (maybe, upside-down knight) and vice versa. 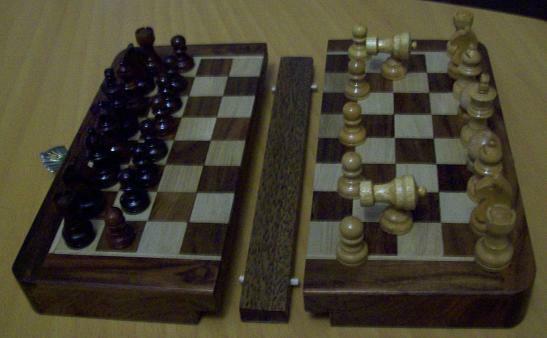 My own suggestion: large rook and bishop symbols for FC and AM, as they have same move, and small rook, knight and bishop symbols for lance, HH and silver general, as they are related to these pieces. And small queen is for gold general (if similar set will be used for shogi variants, large queen for free king). For convenience, generals (and other one-step pieces in variants) must have small arrows, pointing in thier diretions. Yes, I'm inclined toward the same theory. I think the Xiangqi board may have come about by splitting a Chaturanga board in half and playing on the intersections, as is done in Go. It's interesting that Xiang-qi board (when playing on intersection, with standart river) have 64 squares (squares, not playing spaces). Probably, Xiang-qi born after some misundersttanding of Chaturanga rules... Nevermind. I want to tell that if board can be divided into 2 halfs, Xiang-qi can be playing on it. Rich, I'll respond to your comments in the opposite order. >> 2. I personally would rather not have a big X through the forts on the board. The X's are actually 4 strips of vynil, and are just laid on top of the board in the shape of the X's, and are not glued or otherwise permanently stuck on the board. >> 1. I believe Seirawan and Harper forbid their pieces being used for any other purposes but Seirawan chess. I'll let the other comments in progress address this. They have hit the mark and are on the right track. Simon: We don't have any proof that this is what's going on with Seirawan chess. Don't pass judgment until we can get a confirmation from them. I have already sent them an email asking for them to clarify. You cannot dictate what people use your 'Chess Pieces' for. I wonder if Seirawan would object to me using his Hawk as a paper weight? He'll just have to take me to court over it. Honestly, if he doesn't want people to buy his pieces then that's his problem, but I'm sure as Hell gonna promote them, whether it be my own game or otherwise. You know, I don't think it's fair to put words in the mouth of the people who are promoting Seirawan Chess. I mean, if they don't want their pieces used for any other variant, I will understand and respect their wishes. But until I hear from them myself or see that they make a public statement to the effect that they only want their pieces used for any game besides Seirawan chess, I don't think it's fair to state this is what they want. Checkering the board is not really useful in the absence of Bishops. which is then used to represent Ferz throughout all variants in WinBoard. The Elephants and Cannons speak for themselves. for indicating royalty. A normal Wazir could use a turban without ornament. I have several comments: 1. I believe Seirawan and Harper forbid their pieces being used for any other purposes but Seirawan chess. I happened to get into an ugly email correspondence over this. They want their pieces ONLY used for Seirawan chess. I will say that one could put a second queen in there instead of the Bishops, and use the Bishops to replace the elephants, and it should be ok. 2. I personally would rather not have a big X through the forts on the board. But, that would be your choice. I guess if everyone wanted to use it for just Chinese Chess, it might make sense though. For the palace and the river, I'm using vynil strips (cut from a placemat), Seirawan Elephants for the Chinese Elephants, Orthodox Bishops as the Guards, and homemade Cannons. While I'm not usually a Platonist, I tend to think of Chess as a Platonic form of which Chess variants, including FIDE Chess, are just reflections or shadows. In this respect, FIDE Chess, Chinese Chess, Shogi, and the other games on this site are equally Chess variants. Plato's analogy of the cave conveys the difference between how I view Chess verses how most people view Chess. In this analogy, most people live in a cave watching shadows cast by fires, and they take this for reality. But one person escapes from the cave. During his escape, he sees the fires and what have been casting the shadows, and on leaving the cave, he sees the world illumined by sunlight and the sun itself. But on returning to the cave, he cannot adequately describe his experience to the others, because it is fully outside their frame of reference. Like the people in the cave, most people know a single game called Chess and consider this, in all its particularity, to be all that Chess is. When something differs from it in any respect, they consider it to not be Chess. But my experience of Chess has not been limited to this single game, and I know Chess to be something that transcends the particular rules and equipment of a single game. So, when I speak of Chess variants, I don't simply mean games derived from FIDE Chess, I mean different expressions of the form (or general concept) of Chess. Well, the meaning of 'variant' as used by the CVP is very broad. Truthfully, CVP could stand for 'Chaturanga Variant Pages'! 'Chess' is used in much the same sense as George uses it, meaning a kind of chess game. In this sense, all these chesses are chess-variants, including international chess. No one is suggesting that Xiangqi or Shogi are historical derivatives (variants) of international chess; although they are certainly derivatives of Chaturanga-Shatranj. Their unique features, as George points out, make them great. The fact they are derivatives does not decrease their uniqueness or worthiness. In fact, the intrinsic value of variants is one of the 'arguments' implicit in the CVP. 'WXYZ,LargeCV': Xiangqi and Shogi are not CVs because they have been played for about as long by the same order of magnitude of individuals as Western FIDE Chess. Yet CVPage will always have each as some exotic CV in its peculiar world-view, and this reminder of ordinary connectivity can help. Even when playing over the normal Chinese grid, players who first learned 64-square chess visualize square-wise best. Somehow this square-picture also shows Xiangqi for what it clearly possesses: low piece density; dominating features of Rook, Cannon, and palace; minimal rules making deep strategy. Imagine any change in structure: just one example, supposing King not confined to palace would make checkmate too elusive. The same total coherence would not apply to Shogi (having different merit) in its family of sets of rules. Comment continues at Xiangqi-thread pages. Playing on squares doesn't bother me, but I would suggest that -- since the player has to make his own 9 x 10 board anyway -- there is no good reason to make the squares checkered dark and light, because this game doesn't have diagonal sliders. I would probably shade the two fortresses, and maybe also mark the squares that constitute the Elephant's domain with a dot in the middle or something. But the idea of introducing Xiang Qi to westerners with a more western-appearing set sounds reasonable. I disagree. Xiangqi should be played over a grid, not squares. That probably explains the Horse and the Elephant move. On squares, it's more natural to jump over an intermediate piece. On a grid, the intermediate piece blocks the way. 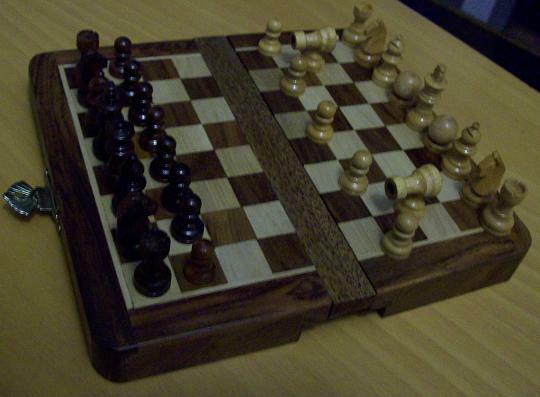 Then, since there is no long diagonal moves, there is no need in checkering. However, I agree that replacing the XQ piece by figurative pieces (Staunton or other) could be useful for popularizing the game in the West. But this has nothing to do with the board. I've been playing for 39 years now. Nice to see other americans might learn this great old game. Very Nice... Can anyone point me where I can download XiangQi board software with western pieces (instead of the one with their readitional character pieces). Thanks. Good idea. Unpalatable to purists, I suppose, but practical.